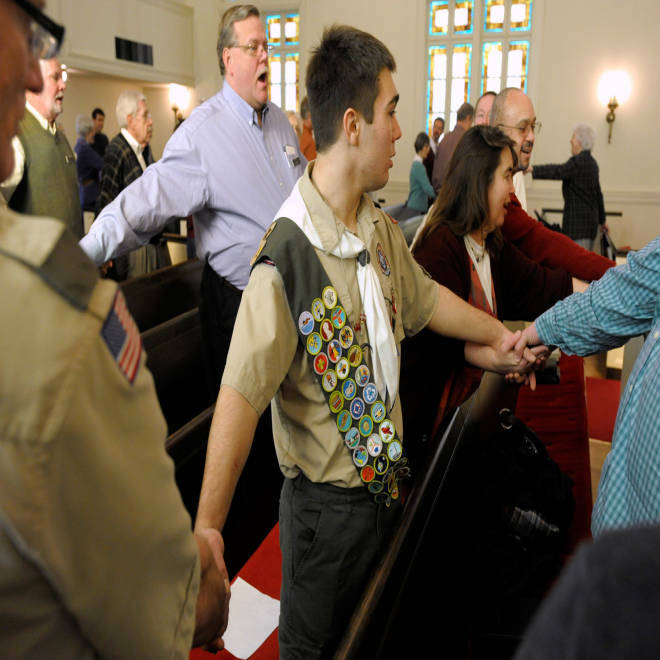 Eagle Scout Addison Jones, 15, holds hands during a hymn with parishioners of the Country Club Congregational United Church of Christ in Kansas City, Mo., on "Scout Sunday." If prayer can't sway Boy Scouts board members as they vote whether to end the organization's ban on gays, it won't be for lack of trying. The Boy Scouts of America announcement last week that it may eliminate the exclusion of gays from membership at the national level, leaving the decision to its local units, has drawn a harsh backlash from some of the organization's more religious conservative members, who are "gravely distressed," even as more liberal churches hailed the move. With more than two-thirds of Scouting groups affiliated with religious bodies, faith plays a large role in the private youth organization. "I think it’s clear that the Scouts have made a sea change in who they are and that down the road they will be a different organization than they are today,” said Roger “Sing” Oldham, spokesman for the conservative Southern Baptist Convention Executive Committee, whose leader, Frank S. Page, urged for a prayer to be held among congregations on Sunday that the board members would not allow gays. “I think there are a lot of parents and students who will make the decision to look for other organizations that are more in line with the principles that they espouse,” he said. The Scouts' began National Executive Board and Committee meetings on Monday, and a decision on the gay ban is expected Wednesday. In the Scout Oath, youth pledge to do their "duty to God," and the organization holds special celebrations in tandem with churches, such as “Scout Sunday,” just ahead of the Feb. 8 anniversary of the founding of the Boy Scouts in 1910. This year, "Scout Sunday" was held Feb. 3 in a number of congregations across the country, and people on social media reported troops receiving their religious medals and posted pictures of Scouts in uniform at church. The BSA offers a guide to the church observance on its website. A church in Kansas City, Missouri, says all boy scouts and troop leaders, regardless of sexual orientation, should be welcomed to participate in one of America's largest youth organizations. KSHB's Alicia Myers reports. “And because churches have been the sponsoring organizations of most troops, that is why (allowing gays) is such a threat and the backlash has really been so harsh” by religious conservatives, he added. For some who oppose gays in the Boy Scouts, the decision comes as an about-face just seven months after the organization said it was sticking with the policy following a confidential two-year review of the disputed membership guidelines. That review was announced months after Jennifer Tyrrell was dismissed from her post as leader of her son’s Tiger Cubs den because she is a lesbian, and a few months before California teen Ryan Andresen was denied his Eagle award because he is gay. Both cases made national headlines for several weeks, roiling the private youth organization. Some critics pointed to declining membership numbers as a sign that families were being turned off over the issue. Though the Southern Baptists have issued strong statements appealing the proposal, the Mormon church and the National Catholic Committee on Scouting have declined comment until the Boy Scouts make a final decision. The United Methodist Men, which has as one of its missions to train youth to be leaders through ministries with the Boy Scouts, told supporters it knew there were “strong and legitimate concerns on both sides of this issue.” The group backed the Boy Scouts in a U.S. Supreme Court case opposing the inclusion of gays, which the BSA won in 2000. “This is a BSA decision which we did not ask for,” Gilbert C. Hanke, general secretary of the General Commission of the United Methodist Men, wrote in a Jan. 31 statement posted online. For some in that community, such an approach was welcome. But for others, gays have no place in the Scouts. Jordan E. Clay, a Mormon from Bloomington, Ill., who is an adviser to various local troops supported by his church, said he was saddened by the proposed change. He believed BSA was motivated by a fear of losing corporate sponsorship dollars, as it has in recent years from the likes of Intel and Merck, due to the policy. Hanke and Page, of the Southern Baptist Convention, said the BSA had informed them of the proposal two weeks before it was announced publicly. Page said in an online statement he was “gravely distressed” when he first learned about it, and even more so when he learned that the recommendation to the full Scouts’ board had already been formalized. When asked for comment on how some of the more conservative faiths were responding to the proposed policy change, Boy Scouts spokesman Deron Smith wrote to NBC News in an email: "We recognize, deeply respect and appreciate the sincere religious beliefs about this issue." He also said: "The process of this discussion was an internal dialogue, within the Scouting family, about what would be in the best interest of Scouting." Rev. 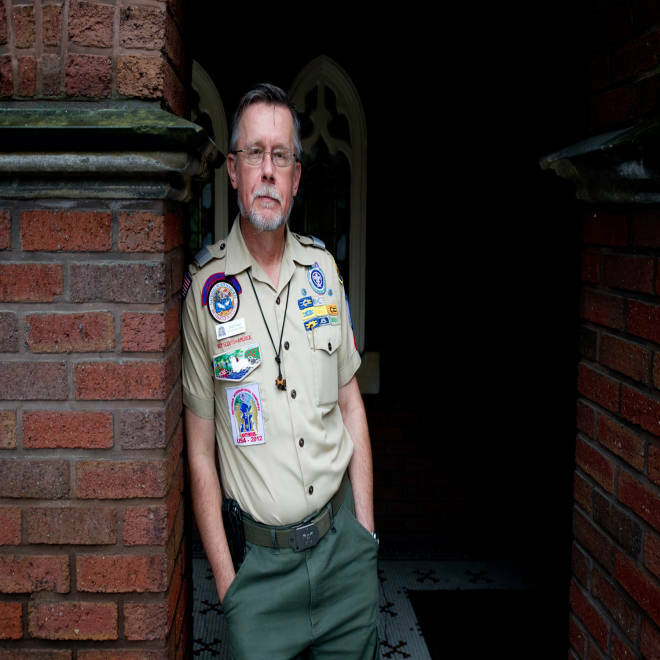 Scott Thayer, a Boy Scout chaplain for the Ohio River Valley Council who is a minister in the Christian Church (Disciples of Christ), supports changing the policy to welcome gays but has curbed his rhetoric at the local level to pastor to everyone, regardless of their stance on the controversial issue, during this emotional time. Terry Howerton, who started the popular Scouting forum Scouter.com network in the mid-'90s, said there was a lot of “apocalyptic” chatter in the wake of the announcement, but he felt it was coming from outsiders trying to use the issue as a tool in the pop culture wars. Obvious, he noted, because the Boy Scouts underwent similar passionate trials when the organization allowed African-American boys to join and women to serve as leaders –- all by letting the local units decide. “Racially we went through this, and for women we went through this, and we’re going through the exact same thing with gays,” said Howerton, a 40-year-old entrepreneur from Evanston, Ill., who left the organization about five years ago over the policy but now is thinking of returning if gays are allowed. Advocates on both sides of the issue have stepped up their campaigns ahead of the final decision: They’ve encouraged their backers to make their voices heard through a phone-in and email deluge, and Scout leaders ousted because they were gay will deliver petitions with more than one million signatures to Boy Scouts headquarters on Monday. But the Rev. Scott Thayer, a Boy Scout chaplain for the Ohio River Valley Council who has quietly been working within the organization for years to change the policy to welcome gays, said as of late he has tried to stay out of the local conversation so he could “be the pastor for everybody, not just the ones who agree with me,” during this emotional time. (Bob Drury, a leader of the Ohio council to which Tyrrell also belonged, told NBC News that he has received positive and negative reactions to the possible change). “There are people who are just, you know, hanging black crepe right now for the Scouts, and I don’t think that’s going to happen,” said Thayer, chaplain of Bethany College in West Virginia and a minister in the Christian Church (Disciples of Christ), which allows congregations to decide whether to welcome gays and sponsors some 35,000 youths who participate in the Boy Scouts. If you are a current or former member of the Boy Scouts and would like to share your thoughts on how your troop, pack or council is handling the possibility of a change in the membership policy, you can email the reporter at miranda.leitsinger@msnbc.com. We may use some comments for a follow-up story, so please specify if your remarks can be used and provide your name, hometown, age, Boy Scout affiliation and a phone number.